A Kiss style CCR is a manually flown mixed gas CCR that has a small constant mass flow of oxygen added to the loop to increase the time between manual gas additions. The proud owner, designer, and manufacturer of the SMIDA is mr Peder Seippel, a dedicated diver living in Stockholm, Sweden. He can be contacted at peder@seippel.nu. Make sure you check out his page at www.seippel.nu. The unit with cover on, both the upper and lower housings are repainted in a more visible (and good looking?) bright yellow colour. 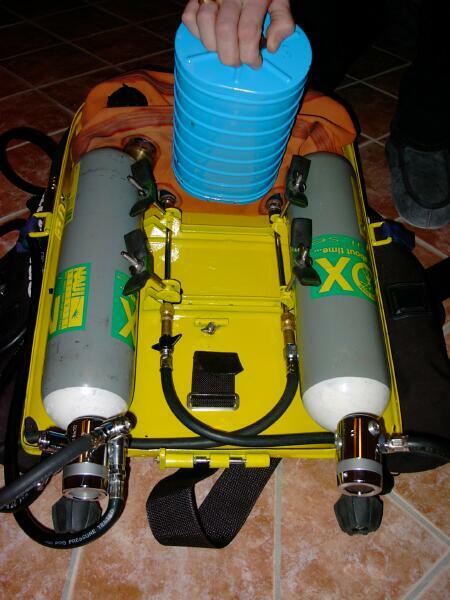 Two 2.5 L steel cylinders with Poseidon valves are used to supply diluent and oxygen to the SMIDA. A bar protecting the valves and allowing the unit to be placed on the end is to be added during the spring. 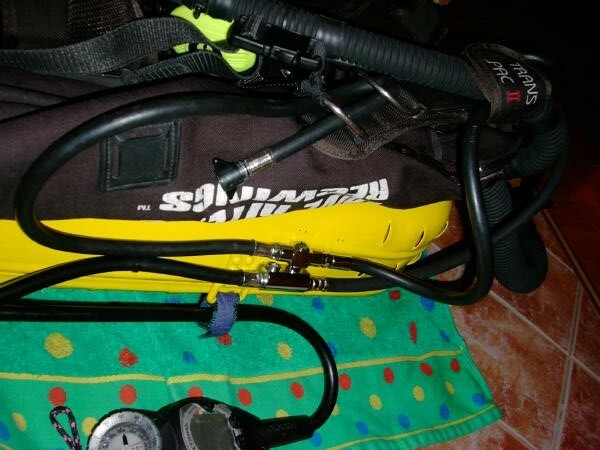 The original IDA harness is removed completely and a Dive Rite Transpac is used as harness and secondary buoyancy control device. Without the cover. Only one of the two canisters originally used in the IDA has been kept. The plugged connectors for the second canister are visible above the left tank. 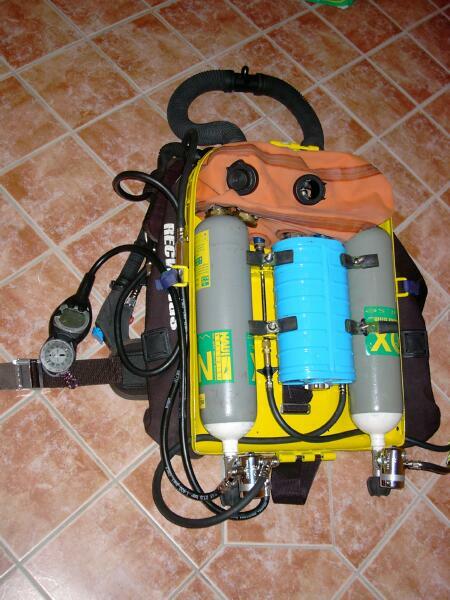 Two Draeger P-port are used to connect 1 + 2 oxygen sensors into the breathing bag. The diluent is fed to the original demand valve. The valve is modified with a press button a la Dave Sutton (see www.nobubblediving.com again) to allow its use for manual bypass. The original IDA over pressure valve is kept as well. The diluent gas block. In this version the diluent is used for suit insufflation, wing supply as well as for an OC bailout demand valve. The oxygen tank to the right with a non-ambient referenced APEX DS4 feeding a KISS valve (see www.jetsam.ca). The KISS is seen to the right lying on the floor, it combines a constant mass flow (i.e. choked flow) orifice and a manual bypass valve. The diluent tank to the left has a standard ambient referenced APEX DS4. 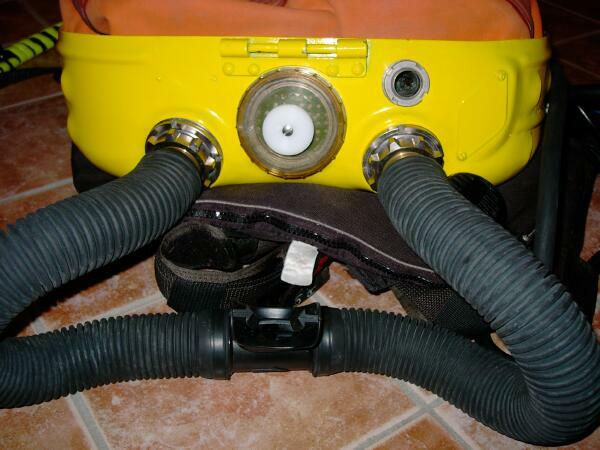 The two gas addition lines, the original stainless steel tubes were cut and Swagelok fittings (www.swagelok.com) were used to connect fitting for ordinary dry-suit quick connectors. The right line feeds oxygen directly into the loop from the KISS valve assembly. The left one supplies the original IDA demand valve with diluent. 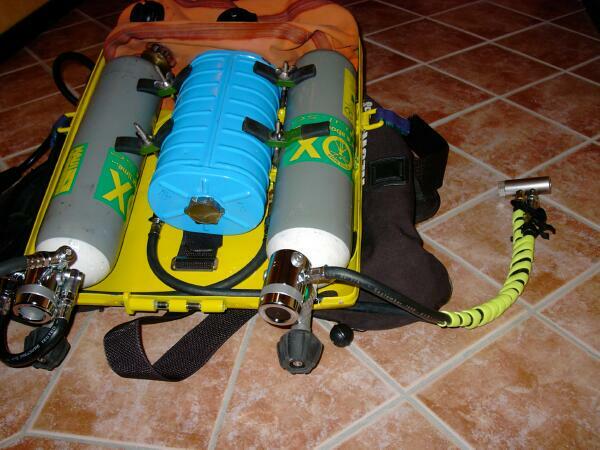 The unit is equipped with Draeger Ray hoses and DSV.